Just hours after receiving its TENAA certification in China, Samsung officially introduced the Samsung Galaxy C7 in the country. Earlier today, the manufacturer took the wraps off of the Samsung Galaxy C5. 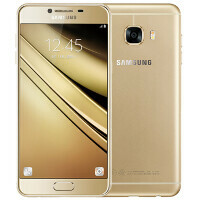 The Galaxy C7 features a 5.7-inch Super AMOLED display, with a 1080 x 1920 FHD resolution. The Snapdragon 625 SoC that drives the unit comes with an octa-core 2GHz CPU, and the Adreno 506 GPU. 4GB of RAM is inside along with 32GB or 64GB of expandable storage. Those seeking additional memory can turn to the 128GB capacity microSD slot. A fingerprint scanner is embedded in the home button. A 16MP camera with an f/1.9 aperture is found on the back of the phone, with an 8MP selfie snapper in front. The latter also sports an f/1.9 aperture which should allow users to take quality selfies under low-light conditions. Keeping the lights on is the job of the 3300mAh battery, which charges up quickly thanks to QuickCharge 3.0. Android 6.0.1 is pre-installed. Like the Galaxy C5, the Galaxy C7 is metal-clad and thin (6.7mm); the device tips the scales at 165 grams. It will be available in gold, pink gold, silver and grey. While availability remains unknown, the 32GB model is expected to be priced at the equivalent of $396 USD, while the 64GB version should cost the equivalent of $427 USD. Looks like the Ativ S but with extra antenna bands. More like a metallic S5?! It looks nothing like the S5. S5 had a perforated back, was thick and had huge bezel. This phone is anything but that. It closely resembles S6 though. Looks like a killer, hope they do launch it over the world, not just limiting it to china, would buy it for my Dad. Even if they don't launch this particular phone everywhere, the design eventually might see it spreading to other models they launch in future. May even be in the next Note that will be launched later this year. Well they should have used more antenna lines/patterned back or a slightly squarish design over the rounded one...but never the less seems good. Its good to see people that aren't Blind. It's good that the price different between 32GB & 64GB make sense (about $30). Since these are aimed at China can we say that the C stands for China? Is this the first SD 625 powered phone? Wonder how it will perform. Samsung should use in house SOC's than SD. SD have not so good performing GPU on all SOC except flagship SOC. What I hate from Samsung SOC is NOT 'really' Quick Charge, it's samsung version of QC (called Turbo Charge?). I really want samsung to give us Quick Charge charger that compatible with other brand (Sony, HTC, LG). QC has quick charge and Samsung has licences to use it on it's own chips (exynos). They just name it fast charging. Yes, I know. But Samsung version of Quick Charge Charger (Fast Charging) is NOT compatible with another phone. ex. I own several phone, and so does my wife, and also kids. If I bought samsung phone with Fast Charging, it would only charge fast on my (or my wife) samsung device, BUT NOT my (or my wife) OTHER BRAND phone. That's my problem... and PS, I already test that. My wife Galaxy Note 4 Fast Charging charger is NOT compatible with Sony Xperia Z5 & Asus Zenfone 2, LG G4. I also test that the Asus Zenfone 2 Turbo Charge (Asus version of Quick Charge) is NOT compatible with Samsung Galaxy Note 4, Xperia Z5 & LG G4. Samsung phones with quick charge are compliant with Qualcomm's quick chargers. Yes, I know, but it's not the other way around.... Samsung version of Quick Charge Charger (Fast Charging) is NOT compatible with another phone. ex. I own several phone, and so does my wife, and also kids. If I bought samsung phone with Fast Charging, it would only charge fast on my (or my wife) samsung device, BUT NOT my (or my wife) OTHER BRAND phone. That's my problem... and PS, I already test that. My wife Galaxy Note 4 Fast Charging charger is NOT compatible with Sony Xperia Z5 & Asus Zenfone 2, LG G4. I also test that the Asus Zenfone 2 Turbo Charge (Asus version of Quick Charge) is NOT compatible with Samsung Galaxy Note 4, Xperia Z5 & LG G4. The same thing can also be said on Samsung's midrange chipsets. I guess with same cost Samsung can use better in house SOC compared to similarly priced SD. BTW why no one is using 20nm fabs? I can't wait to see this Snapdragon 625 hit the benchmark. I'm really curious what's the LOW END CPU with 14nm can do from battery life / power usage to performance. SD625 seems a worthy opponent of helio P10. The SnapDragon 800/805 should be very cheap now, why not use those. It would be a much better GPU. I am sure these newer ones are very efficient, but how do they test vs the early SD 800 series?